I was trying to follow a pattern to make a cover for my new tablet and it just wasn't working. I think I pulled it apart three times. 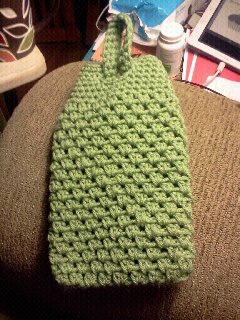 Finally, I decided to just crochet one of my purse patterns on a smaller scale. This cover was made with v-stitches in the round. What makes me so happy about it is that I crocheted a pull through strap so that my tablet won't fall out. Row 1 (in the round) Chain 12 and crochet 5 sc in the second chain from hook. Crochet 1 sc in each chain and crochet 5 sc in the last chain. Crocheting around to the other side of the chain, 1 sc in each chain to end. Slip stitch in the first sc. Row 2: Chain 2 and hdc in same st. Skip 1 sc and 2hdc in next st. Continue pattern (skip 1 sc and 2hdc in next st) to end. 1hdc in the same st at the original chain 2 and slip stitch to the top of the first hdc. Slip stitch in to space. Row 3- 18: repeat row 2. Row 19-21: Chain 1 and 1 sc in each stitch around. Slip stitch to original sc. Row 22: Chain 1 and sc in the next 5 stitches. Chain 20 and skip 6 stitches. Sc in the 7th stitch and continue sc in the next 10 stitches. Slip stitch in the next 6 stitches and sc in the remaining stitches to the end. End with a slip stitch in original sc. Row 24: Sc in each stitch around (optional: skip first two stitches of the loop and slip stitch into the third sc. Sc in each of the next 13 stitches. Skip the last two sc and slip stitch into the first after handle. Continue 1 sc in each chain around to end.) Slip stitch in first sc and fasten off. Weave in ends. P.S. I took this picture with my new Samsung tablet! How many stitches around did you end up with? My second round has 28 and so does every round after that. I am missing something. I don't have the hole for the loop to go through. I assume it is where the slip stitches are but I don't see where you skip them? I'm just writing to let you know that I've read your message and promise to get back to you very soon. I'm under the weather right now, but will touch base with you in a few days. I'm sorry for the delay. If you haven't heard from me by Thursday, please do not hesitate to contact me! Would there be a knitted version of something like this? Thanks!